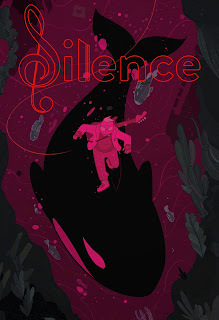 Fifth World's Indie Watch is back for its second installment, this time with Devin Kraft, creator of "Dragon Slayer" and the innovative "Silence", now featured in a Kickstarter campaign for the epic "Silence: Wall of Sound" collected edition. Silence is a comic about music and the power it has to hold everything together when the world seems to be falling apart. The story takes place in the music town of Anthem, whose male population continues to dwindle as ships go missing at sea during routine shipping runs. The South Seas Capital Company holds Anthem in a death grip of debt, and many of its employees struggle to keep their houses from being repossessed by the bank. Johanna Jones, a runaway from the town of Anthem receives a letter from the SSCC informing her that her father has gone missing after The September, the ship he was aboard, failed to return on time. They plan on repossessing her childhood home and allow her several days to collect any important belongings. Johanna reluctantly returns home to try to put together an expedition to search for The September’s whereabouts. 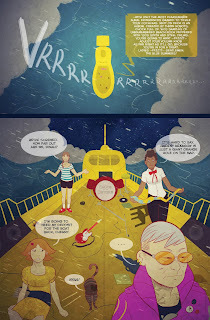 Along with her best friend, a washed up elderly ex-punk rocker, an on again off again addict, she sets off on a yellow submarine called the Heart of Gold for Hades’ Hexagon, a mysterious area where ships keep disappearing. You can check out the free 12-page preview here. Devin and I executed this interview by going back and forth via email and a little bit of Facebook chat. On with the show! The Silence: Wall of Sound Edition is a complete graphic novel that clocks in at over 170 pages. Does this include the previously published "Silence works" (Track One, Track Two, and so on)? Yes! The Wall of Sound Edition is the ten-cent name for the collection, and includes Track One, Track Two, and Track Three. Understanding that you could always do a sequel, is this a complete story onto itself? It's an entire story. I like to approach each project as a contained story, rather than something serial. I would love to do a serialized story, but being independent it feels better to try my hand at different genres and art styles each time. What is the genesis of Silence? Where did the idea come from? What was your goal with it when you started? How did you develop it? It's kind of funny, but the original original idea came from the Bechdel Test. Everyone should have heard of it by now, but basically the test is: does a narrative have more than one female character, and do they interact about anything other than a man. From there, I thought, well, an all-female cast could solve that. Then I kind of imagined an island where some horrible fate had befallen the male population, and the idea kind of spiraled out from there. I like to find something I'm passionate about and wrap the concept around that, so I chose music as a theme, and slowly but surely the band emerged. I tried to envision the four characters as embodiments of music from four decades of music spanning the 60's to the 90's. Can you tell us a little about the characters, themes, and plot of Silence? That's a big question! As mentioned above, the main characters were sort of embodiments of folk, soul, punk, and grunge. One of main themes is courage, as the girls set off into the unknown to try discover the whereabouts of all the men that have gone missing. There's a bit of women vs. nature in there, as they battle the elements to get to their final destination. Hell, they even battle death itself! "Silence" stands out with its dynamic artwork and original concept – focusing on an all-female band of musicians instead of an all-male group of warriors. Can you talk a little more about the plot and how that difference led you down different story avenues? Can you also expand a little on how the focus on music works into the plot? The story centers around Johanna, who ran away from home. After a few years, she receives a letter saying her father's ship had been lost at sea. This sets her, and a team she assembles, to go on a quest to find him. 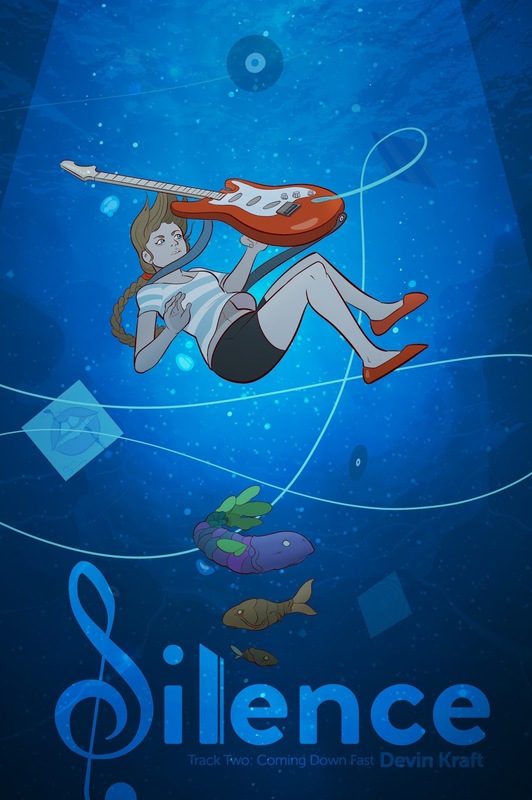 It starts out in a small coastal town called Anthem, and that town is sort of like Nashville by the sea, so all of the protagonists have some sort of a relationship with music. 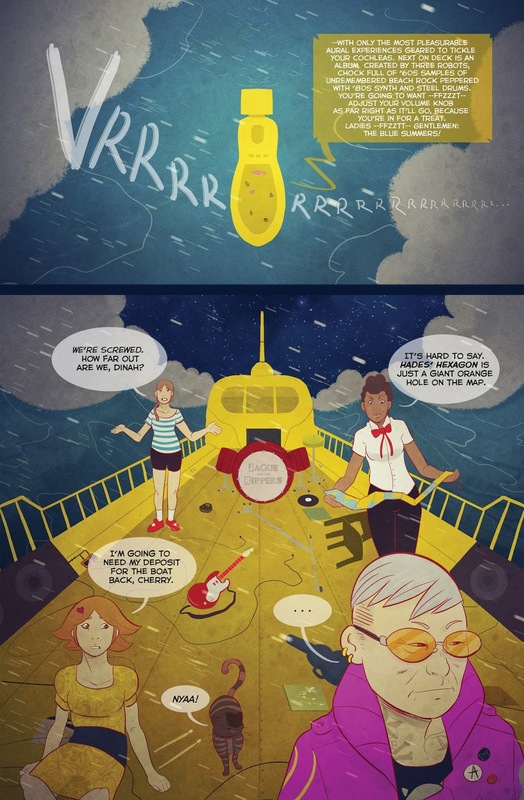 Johanna learned guitar from her father, Dinah is a famous soul singer in a Jackson 5-styled band in the area, Meg's mother forced her to learn piano, and Cherry owns a showboat that just happens to be a giant yellow sub. There's a lot of nods to my favorite bands, as well as famous bands from multiple genres as well tucked into the corners of the book. Are there any of the characters that you found to be particularly challenging to write? How did you approach overcoming that challenge? I had a bit of trouble writing Dinah, who sort of gets roped into the adventure on accident. She's unsure of herself, and doesn't want to be on the adventure at all. I made it a point to kind of slow the story down for a bit so we could get to know her a bit better. I really clicked with Johanna, then became kind of lost having too much fun with Cherry and her backstory. Meg has a nice story arc as well. Can you talk about researching both the music and nautical angles and how that research found its way into the story in cool, surprising ways? 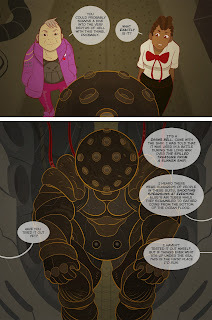 There's all sorts of fun nautical stuff primarily in the middle of the book, like an old timey diving bell, or a plot point that hinges on what noise and force can do underwater. There's a few fun fish designs in there too. If I had more time, I really wish I could add more fish into various places in the book. How much of the artwork is physical and how much of it is digital? What software did you use to create "Silence"? 100% digital! For speed's sake, I work primarily digitally these days. I'm more acclimated to a few brushes I have in Manga Studio more than anything I have in real life these days. It's made using a mix of Manga Studio/Clip Studio for pencils and inks, then Photoshop for colors and finishes. What were the biggest storytelling and visual art challenges you faced while creating the artwork for "Silence", and how did you handle them? Far and above the biggest hurdle is doing everything solo. It's so hard to articulate how hard it is to do full chores. It's this insane decathlon where you push yourself to get a script, and you think you're spent and gave it all you have, only to pass the baton to yourself and pencil the whole thing. This time you're spent for sure, but you stumble the baton to another version of yourself, and he inks it. He's dead on his feet, and passes it to colorist you. Then letterer you, then graphic designer you, then motion graphics you, then promoter you, and so on and so forth until you have no idea how you made it to the finish line. – conventions, sequentials, conventions, sequentials, Kickstarter prep, execution, conventions, shipping. It's been super intense. If I can at all avoid it, I'd love to not color sequentials going forward, or promote, or pre-press. When writing for yourself as the artist, do you write a full script? What is your overall workflow from story idea to finished page? I wrote a full script for the first and second issues. When I hit the third issue, I found I could either procrastinate on waiting for a full script that took the project to it's finale, or I could block in all the scenes I knew where going to have to be there, do a rough pass at dialogue, then come back and write the final dialogue when everything was in place, so I kind of did things backwards, but it was all I could do to keep moving. From Track One to today, what are the biggest lessons on writing and drawing comics that you've learned while making "Silence"? This is tough! "Dragon Slayer", my previous project, was more of a male power fantasy, and it feels like it sold better. It feels like "Silence" is a bit of an uphill battle, sales-wise, so I might do something a bit simpler for the next project. I'm definitely going to avoid doing full chores, because at 2-3 years per project, I would only have so many projects in me. I like to think of them as one man films, so if I could get the production time down to two years a pop I'd be happy. I also might avoid painted backgrounds going forward, but it was a fun experiment for this project. What works, in any medium, would you say most influence "Silence" and in what ways? Wes Anderson films, and their fun attention to detail was always something I'd think back to. Miyazaki films. The Odyssey. Ronald Wimberly's Prince of Cats. Music-wise, too many to list! Are there particular writers and artists who you find particularly inspirational, with regards to "Silence" or generally? Agh! I could go on for days, but the artists I tried to channel as best I could: Otomo, Terada, Fiona Staples, James Harvey, Ronald Wimberly, Miyazaki a bit? It's all my poor interpretation of some of these guy's stuff, but I think the whole is its own thing. For indie comics, guerilla marketing is obviously hugely important. How do you approaching promoting yourself and your own work? What you have found works well for you and what doesn't seem to work very well? Guerilla marketing is super tough. I try to educate my social media audiences as best as I can. I used to try to contact press to review the comic or check it out, but that was a lot of hustle for relatively little reward. When speaking with other indie creators, I keep hearing that there is more they would like to do to promote their own work, but between day jobs and actually making comics, they just don't have the time to pursue it. If you had the time, what things would you do to promote your work that you aren't able to do now? – I'm kind of working on that puzzle piece myself. Can you tell us about your background as a student of art and now professional, particularly as it relates to comics and how you got here? I've drawn since I was a kid, but I got a degree in film at Baylor University. Films take a lot of people working together, but you can do a comic solo with just your imagination and some sheer determination. I went freelance in 2012 and worked for myself until late 2016, where I took a job with a graphic design agency. I drew comics all through college, and I've probably drawn 30 or 40 feature length comics by now, but few of them are things I put out there publicly. Looking to the future, what comic book/graphic novel goals do you hope to pursue next? I might transition to black and white next, so I can focus on telling a story instead of spending most of that time coloring the book. I have a few concepts, but I'm still trying to decide. Are there other story concepts, visual themes or styles, you hope to explore in your near-future work that you can talk about? I might do a sci-fi project next, as I have a lot of fun in that space. As both a writer and artist, what is the best advice you have for someone just starting to write or draw their own comics? Practice! You'll hear that a lot when you ask professionals how they got to where they are. But above that, push yourself. You can draw the same thing a million times and not improve-you have to practice with an aim to get better to really achieve your goals. Do what you don't normally do to achieve what you don't normally achieve. The Kickstarter campaign is very cool. At different pledge levels backers can get physical and/or digital copies of not just Silence but some of your other works as well. You also have some cool themed extras like the cassette tape style USB with a digital copy of the graphic novel on it. Can you talk about some of the other themed extras you put together and what went into creating them? I usually go nuts creating tons of themed rewards for each Kickstarter campaign. Working a day-job, my free time is basically cut in half, so I kept this campaign relatively bare bones, with most tiers consisting of Issue 3, the trade, an anthology I worked on, my previous graphic novel, or a combination of those. The USB Mix Tape is the most exciting reward I have that's not the book, and I'm really excited about that! If I edge towards some stretch goals, I'll start working on poster designs as well, I think. I know it's early and understand if you can't say anything, but can you give us a preview of any stretch goals that might be coming? Ideally my stretch goal rewards would be stuff I can fit in with the existing shipping plan, so maybe posters or postcards. Pins would be super super cool, but I'd need to make sure I could get at least 50-100 people interested before I could confidently pull the trigger on a pin run.